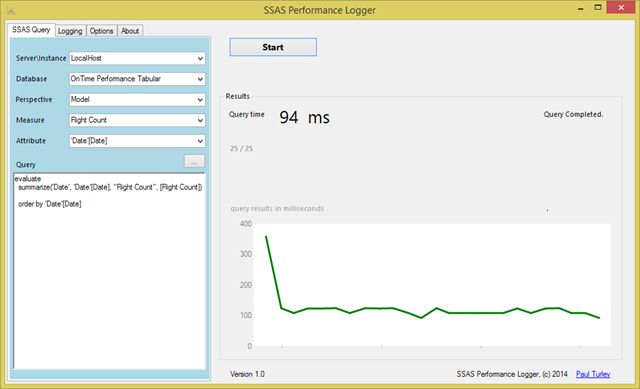 I’ve created a simple query performance logging tool for Analysis Services, called the SSAS Performance Logger. The tool allows you to navigate through the metadata for a tabular model and select from measures and table attributes to build a simple query which is executed and timed. The query can be executed many times to get an accurate sampling of test variations and to test performance while various loads are placed on the server. I literally created this over the weekend and plan to add additional capabilities as time allows – so please check back. To provide feedback, add comments to this post. My initial objective was to choose two different measures that were alternate methods of calculating the same value, run them side-by-side and then see which performed best. Then it occurred to me that we can run any number of measure performance tests in iterative loops and compare the results by playing back the captured log results. Since the results are captured in a log database, the test results for each measure or query can easily be compared and analyzed using tools like Excel and Reporting Services. One of my main objectives for a future version of the tool is to add logging for server performance counters like memory usage, thread counts and CPU capacity; while these queries are running. 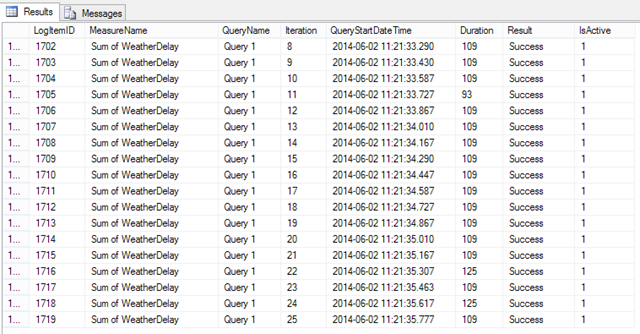 I’ve developed SSAS Performance Logger for use with SSAS Tabular in SQL Server 2012. To manage the logging database, it uses the OLEDB data provider for SQL Server 2012 which may be backward compatible as far back as SQL Server 2008. It also uses the ADOOMD data provider version for Analysis Services. 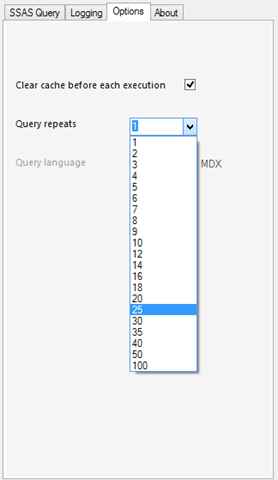 When MDX support is added to a future version, it should support SSAS sources as far back as SSAS 2008. With these components installed, you should be able to copy the executable to a folder and run it.